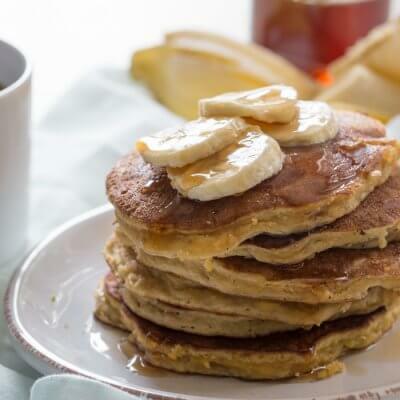 Paleo Banana Coconut Flour Pancakes, a gluten free dairy free pancake recipe for fluffy paleo banana pancakes made with coconut flour. Grease cast iron skillet with coconut oil and heat to medium heat; once heated reduce to medium low (about 3 or 4 on electric stove). Combine flour, baking soda, salt and cinnamon in a small mixing bowl. Grab a large bowl and mix together bananas, eggs, almond milk, vinegar (this is a MUST), and vanilla extract. Add coconut flour, baking soda, salt and cinnamon to banana/egg mixture and stir until combined. Spoon 2 tablespoons batter onto skillet and spread with spoon to form pancake. Flip after a few minutes once pancake is golden on bottom. Repeat to make about 7 pancakes.